NovAtel, Inc. has introduced the newest member of its OEM6 receiver family: the OEM615. Measuring only 46x71x11 millimeters (1.81×2.79×0.43 inches) and weighing 24 grams (0.84 ounces), the diminutive OEM615 provides precise positioning in a familiar, compact form factor. As with all NovAtel OEM6 series receivers, the OEM615 tracks existing and planned GPS, GLONASS, Galileo, and Compass signals. With 120 dynamic channels configured to track GPS + GLONASS L1/L2 now as well as constellations and signals yet to become operational. 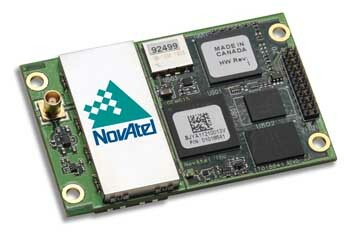 According to the company, the OEM615 is backward-compatible with NovAtel’s popular OEMV-1 series form factor, providing integrators an upgrade path to bring new products to market quickly. The receiver supports NovAtel performance-enhancing firmware options, including AdVance RTK, ALIGN, and GL1DE, as well as receiver autonomous integrity monitoring (RAIM), enabling users to configure the OEM615 for application-specific needs. Application programming interface (API) functionality provides system developers the ability to eliminate system hardware and reduce reducing development time. The OEM615 receiver is available for purchase immediately.